After the war, he served in Paris as America's minister to France. During his absence, members of the Constitutional Convention contacted him, asking for his support of the new constitution. He gave that support, but only on the condition that the Bill of Rights be added. When he returned from Paris, he served as President Washington's secretary of state until 1793. He ran for president against John Adams in 1796, but became Adams's vice-president, as the custom during those days was for the winner to become president and the loser to be his vice president. He ran again in 1800 and won, serving two terms as America's third president. While he was in office, he commissioned Lewis and Clark to lead an expedition across the Louisiana Purchase. After his second term in 1808, Jefferson returned to his Virginia plantation, Monticello, where he worked as an inventor, scientist, architect, and linguist. It was during those years that he established the University of Virginia. 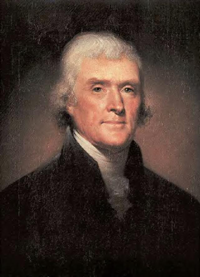 Jefferson died on July 4, 1826, fifty years to the day after the Declaration of Independence was signed and. Coincidentally, that was the same day that John Adams died. Raised Episcopalian, Jefferson believed that the New Testament had been polluted by early Christians eager to make Christianity palatable to pagans. He believed that they had mixed the words of Jesus with the teaschings of Plato and the philosophy of the ancient Greeks. The authentic words of Jesus were still there, he assured his friend, John Adams. He determined to extract the "authentic" words of Jesus from the rubble which he believed surrounded His real words. That book, intended as a primer for the Indians on Christ’s teachings, is commonly known as the "Jefferson Bible." "I am a real Christian, that is to say, a disciple of the doctrines of Jesus. I have little doubt that our whole country will soon be rallied to the unity of our creator."